Frankly, I was not keen with the idea of using unofficial apps. For one, they are not terribly efficient and I’ve heard plenty from friends having trouble with them that many ended up simply uninstalling the apps. Secondly, I really am not very comfortable about installing unofficial apps and allowing them access to information on my phone. Call me paranoid but how do I know what information are they gathering exactly? Sure, I don’t know what the official app is gathering from my phone either but at least the trust level is higher than that given to some random Micky Mouse outfit. 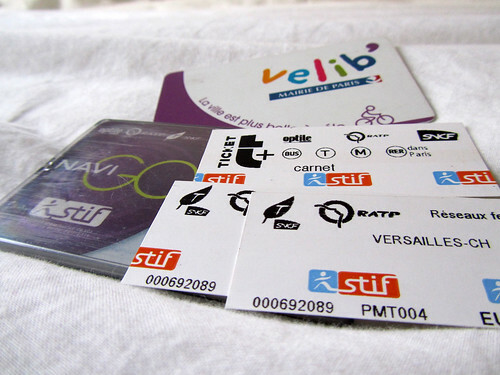 So, go on, hit that Google Play icon now and search to download the brand new official Velib’ app for Android. Want to go to Versailles at the weekend but not feel obliged to stay the entire day after paying for additional zone 4 tickets to get out there from Paris? Or perhaps you have a flight to catch at CDG for a quick weekend getaway? Or inspiration strikes and you think exploring St-Germain-en-Laye would be a good idea? Happy news for (nearly) all passengers with monthly Navigo, annual Navigo, or monthly Solidarité Transport pass. After a delay of 2 months in implementation (as per previous reports), from tomorrow (1 September) onwards, when the clock strikes midnight on Fridays and up until midnight on Sundays, it matters not how many zones you’ve paid your passes for. You. Can. Now. Go. Everywhere (in Ile-de-France). With. Your. Pass. And it is not just for the weekends; any public holidays – same principle applies. Such a wonderful initiative that I don’t even mind the price of my pass being increased by a wee bit: on average 2% to the previous price. Afterall, I normally hold a pass for zone 1-2, and now I could consider venturing further afield of Paris at the weekend without spending for additional single tickets to go places. Anyone on all-zone pass must be feeling a bit left out. Afterall, they’re already travelling everywhere with their expensive pass. Well, should all go to plan as previously reported (same article above), from 1 January 2013 onwards, there ought to be just a single standard price for all pass holders regardless of the amount of zone travelled. That’s right, no more different tarifs for different specified zones of use. Just that one standard rate. This is when it gets really interesting for pass holders of zones beyond 1-2 as there is substantial savings for them to be had, although holders of suburban 2-zone passes may feel some pinch of price increase by about 10%. What I haven’t quite figure out is how they’re going to carry out the third part of the ticketing reform, scheduled to take place in mid-2014. Passengers would be charged based on “mileage”/distance travelled, something along how mobile phone charges can be incurred? We’ll see. For now, let’s just enjoy the perk from the weekend de-zoning initiative. Isn’t the Navigo expansion great? I was so excited to learn about it, too. Especially now that the RER B is restored to full service after the summer travaux! it is awesome! i’m eyeing a couple of weekend afternoon getaways but september/october is such a busy period for birthday festivities. still, i can’t wait to explore more!